For a recent project I was asked to measure the current from a solar photovoltaic (PV) system. This is a typical request as knowing the current is useful for control systems and for measuring power and energy. This blog post highlights some issues and ideas for measuring current. This project was for a domestic grid-connected PV system. PV modules generate DC (direct current) which is then converted into AC (alternating current) by the inverter which also synchronises with the national grid to allow power to flow into the AC national grid. The grid is effectively used as a large battery bank. Shunt resistors are an intrusive measurement method, so these were ruled out for this particular project as we did not want to be affecting the mains voltage wiring. I use shunt resistors to measure current and hence power and energy in the pedalog power monitor. Hall effect sensors, such as these, are relatively expensive, so were also ruled out for this project. I have used these in the past as they can be a very simple way of measuring current. I have had problems with accuracy, especially with low current levels. A current transformer (CT) clips over a cable carrying an AC waveform. 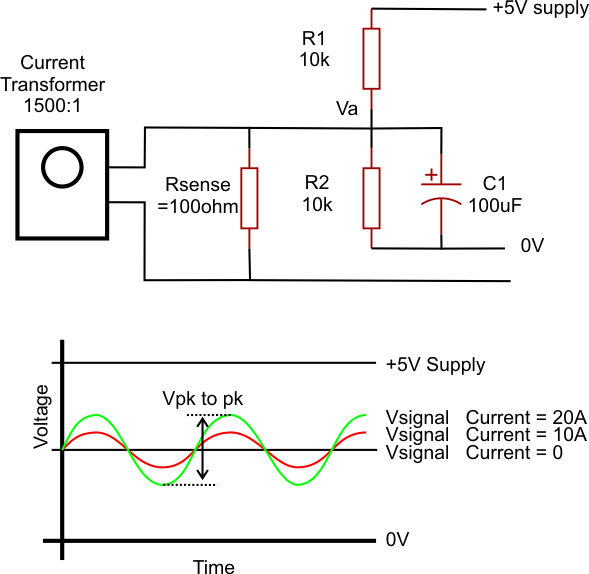 This induces a much smaller current into the secondary of the CT which can then be converted into a small voltage using a resistor (remember: V=IR). The output from this circuit is an analogue AC signal which will vary around 2.5V DC. The amplitude of the AC signal will be dependent upon the current, with a constant 2.5V equating to zero current. This waveform must be measured at a reasonable frequency in order to see the peaks in the waveform. The Nyquist sample rate for a 50Hz current waveform is sampling at a minimum of twice the frequency you are trying to measure, i.e. 100Hz. But this does not include complex waveforms which happen at a frequency greater than 50Hz. In this case you would need to measure the true RMS value. This can be done using a microcontroller, or using a specialist true RMS converter component. In this project I was only interested in peak values and used a PICAXE microcontroller sampling at around 400Hz to monitor the current peaks. Hopefully some of this information might be useful for your power monitoring project.